While most freelance creatives might need those professionals, I contend a healthy business in our field needs a network of Super Friends: i.e., complementary freelancers who have a different superpower from yours. If you’re a Wonder Woman freelance writer or editor, you need a Superman to handle the graphics side of things, and if you’re a Batman freelance graphic designer, photographer, or illustrator (etc. ), you probably will be well served by Robin as your Boy Wonder handling the words. (I’m sure poor, neglected Aquaman fits in there somewhere—so check out the video at the end of the post.) For example, during the revamp/relaunch of this website back in August, I could not possibly have pulled it off without an outstanding creative team to support me. Better quality for your own marketing materials. I know enough about graphic design to know that I shouldn’t be allowed within 50 feet of Adobe InDesign or Photoshop. (Back in the days before digital printing, this rule was strictly enforced by X-ACTO-knife-wielding art directors.) When it comes to my own brand image, I know I’m going to look better by having experts help me out. 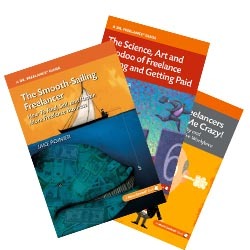 Not only does it save a lot of time and headaches, it ultimately helps me make more money freelancing. Referrals received. This practically speaks for itself: If you have a network of freelance creatives who aren’t competing directly with you, they are a rich source of potential leads. In my own business, they’re the single best referrals I receive, because they know my business and I know theirs, and we have a track record of working together smoothly and seamlessly. Referrals given. Really, this is a combination of benefits 2 and 3: You’re strengthening your own image as a player in the creative community, while having a chance to reciprocate to your fellow freelancers. Better current knowledge. It’s hard enough to keep up with your own field, let alone what’s going on in an area that you only work in occasionally. Why spend 3 hours researching or learning a new program, possibly getting confused or being misled, when you could reach out to an expert in your network and get an instant answer or solution to your problem? Improved brainstorming. We’re in a creative field, sure, but like it or not, we all have blind spots. Having people with different styles, technical capabilities, and experiences enables you to generate better ideas more quickly. More fun. I often hear freelancers complaining about isolation as one of the downsides to the job. Networking with other people in your same line of business can be a solution, but it’s not nearly as energizing as being on a team that’s got diverse perspectives. Adding to your creative team is a long-term process, and your own Hall of Justice doesn’t get built overnight. Start by networking with a few freelance creatives who are in a different field from yours, and getting to know their businesses. Ideally, you should have several close associates with a variety of capabilities, so that you can choose the right person for the job when the time comes, or that you’re ready to spring into action when the Bat Signal projects into the sky. It’s possible that you’re one of those rare creatures who actually has talent with words, design, and technology. If so, I’m jealous! But the reality is, for most of us, that our superpowers lie in one place or another—and the sooner we assemble a team around us, the better off we’ll be. While we’re talking superheros…check out the video for “Aquaman’s Lament” by Mark Aaron James. Very catchy tune, and I don’t feel quite as sorry for Aquaman as I did before. In the comments: What’s your favorite way to connect with freelancers who have complementary skill sets? Great post, Jake. Point #4 (referring clients to other creatives who can better serve them) has another advantage: it keeps you from making a big mistake: namely, taking on a job you’re not right for. That can only lead to grief for both you and the client. I speak from sad experience, having made that mistake early in my career. Referring the client elsewhere makes everybody a winner, including oneself: you build a reputation for putting the client’s interests first– which is what we should all be doing anyway, of course. Great thoughts, thanks for sharing. Thanks, as always, for your thoughtful comments, Mark. You make an excellent followup point; having a network gives you an additional option without having to give a flat-out “no” or making a bite-off-more-than-you-can-chew error.